This is Christmas, all wrapped up ... literally! 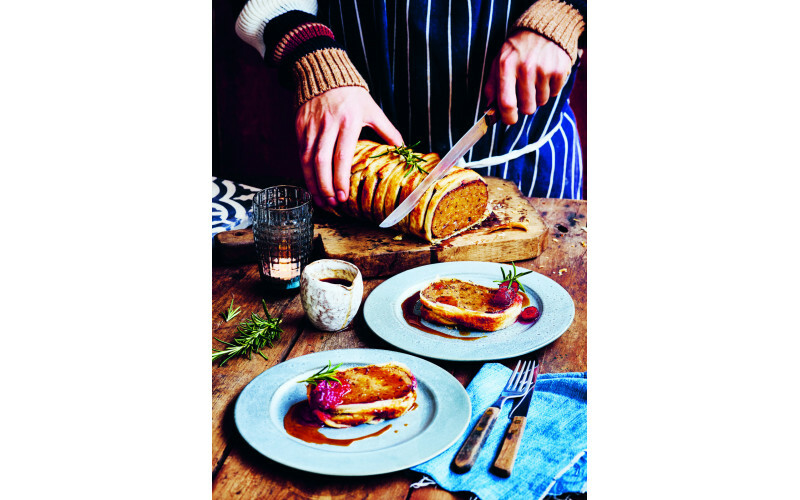 The Christmassy flavours we all love are in this roast “beef” wellington. It’s so succulent and flavoursome. Meanwhile put the cranberries, apricots and chestnuts into a blender and blitz until they’re all a similar size. Add these to the frying pan and sauté for 3–4 minutes until everything has softened. Combine the dry ingredients. Once the wet mixture has cooled slightly, mix with the dry ingredients. It should form a nice dough. If your mix is wet add a little more chickpea flour. Tip the dough out onto a clean work surface and knead for 10 minutes. Leave to rest. Preheat your oven to 170°C (340°F). Combine the rub spices in a bowl. Shape the dough into a sausage 10cm (4in) in diameter. Sprinkle the rub onto your work surface. Roll the dough in the rub. An hour before you want to serve, roll out your pastry into a teatowel-sized rectangle around 3mm (1/8in) thick. Cut strips a third of the width of the pastry on each side, so you can cross them to make a lattice. Spread the cranberry and orange sauce over the roast, lift it into the centre of the pastry, wrap it up, then transfer to a baking sheet lined with non-stick baking paper. Combine the glaze ingredients in a bowl, then brush over the top of the pastry. Bake for 15–20 minutes, or until golden. To sterilize your jars, place them in a large saucepan filled with cold water, place over a medium heat and bring to a simmer. Simmer for 3 minutes then turn off the heat. Carefully remove the jars from the water when you’re ready to fill them.